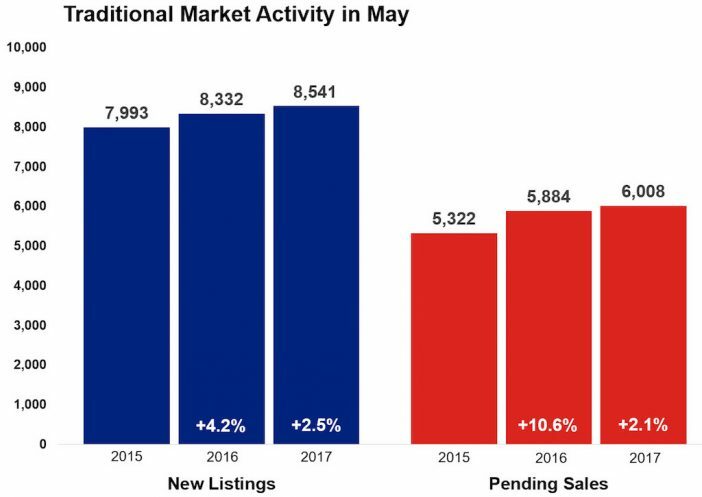 Compared to May 2016, new listings in the Twin Cities inched up 0.7 percent while closed sales fell 1.1 percent. Given that there were 17.3 percent fewer homes on the market compared to last May, it’s clear that buyers remain motivated. Declining foreclosure and short sale activity can contribute to market-wide declines. For example, traditional new listings rose 2.5 percent while traditional closed sales rose 2.1 percent. Those shopping for homes have 11,615 properties from which to choose in the metro area, the highest figure so far this year but the lowest May inventory reading since 2003. Prices continued to rise. The median sales price rose 5.5 percent from last year to $250,000. Nominal home prices have now risen for the last 63 consecutive months. Multiple offers on updated, turn-key properties are common in low inventory environments. Properties also tend to sell quickly and for close to or above list price. Homes went under contract 15.0 percent faster than last May. Half the homes on the market sold in less than 20 days. The average percent of original list price received at sale was 99.5 percent, 0.9 percent higher than last year. Similarly, the median percent of original list price received at sale was 100.0 percent, meaning half the sales closed for over list price. The metro area has just 2.3 months of housing supply—the lowest May reading since 2003. Generally, five to six months of supply is considered a balanced market where neither buyers nor sellers have a clear advantage. A thriving and diverse local economy has been conducive to housing recovery, as job growth is key to new household formations. The most recent national unemployment rate is 4.3 percent, though it’s 3.3 percent locally. The Minneapolis–St. Paul region has a resilient economy with a global reach, a talented workforce, top notch schools and a quality of life that’s enabled one of the highest homeownership rates in the country. The average 30-year fixed mortgage rate has declined from 4.3 percent to 3.9 percent recently, still well below its long-term average of about 8.0 percent. Excluding any surprising data or events, the Federal Reserve is likely to increase their target federal funds rate at least once more this year. Wage and inventory growth are key to offsetting affordability declines brought on by higher rates and rising prices.